Christmas is such a fun time of year! So much excitement and time spent with the one's we love, there's just something in the air around the holidays! This year I'm so excited to be heading back home for the holidays but since hubs sadly won't be joining me for my holiday fun, I'm trying to stock up the kitchen full of things that he can enjoy (and a few little reminders that I love him). It hasn't even been 24 hours since I made these cuties (as I type this) and hubs has already eaten 13 of them. 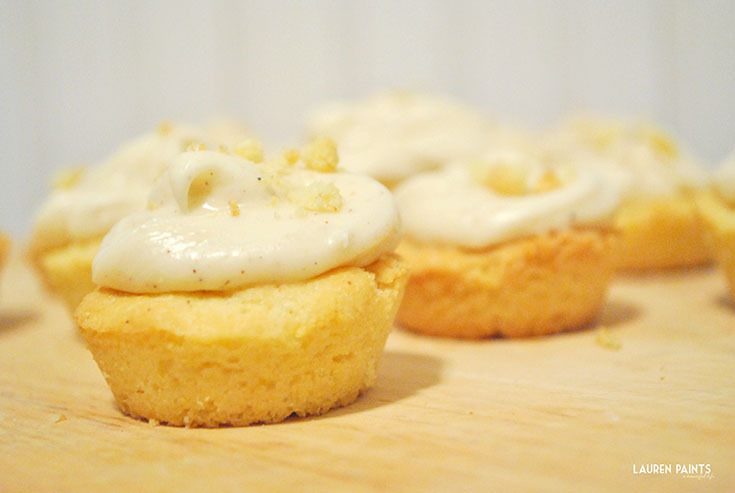 So I suppose this means (a) these Sugar Cookie Cakes with Whipped Gingerbread Frosting are among some of his favorite foods I've made, possibly his favorite ever. and (b) I'll be making another batch before I leave! I think I may even make a batch for family when I arrive to STL, these seriously are the perfect winter treat! Deliciously sweet and packed full of just the right amount of gingerbread flavor - serve these babies up with some coffee or hot chocolate and enjoy while listening to Christmas tunes and lounging with your family. 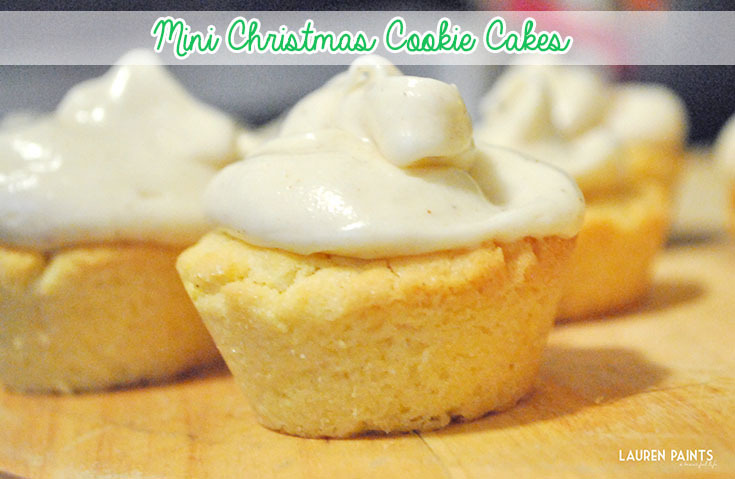 Mini Christmas Cookie Cakes - The perfect flavors to celebrate the season! Begin by preheating oven to 375 degrees. In a mixer combine butter, sugar, eggs, and vanilla. Then stir in sifted flour, baking soda, baking powder, and salt. Mix until dough is thick and crumbly(ish). Press into a mini cup baking dish (or just mini baking cups) and bake for 10 minutes or until the tops of the cupcakes start to just barely crack. Remove from oven and allow to cool completely. While you are waiting for the cupcakes to cool, in a large mixing bowl beat together all of the frosting ingredients - adding the confectioners sugar bit by bit until your frosting reaches your desired consistency! I just use a plastic bag with a corner cut off and frost each cupcake quickly and easily, it's not the classiest way to frost but it's convenient! Once these little babies are frosted, sprinkle a little bit of crumbs from the pan (or a broken up extra cupcake) over the top! 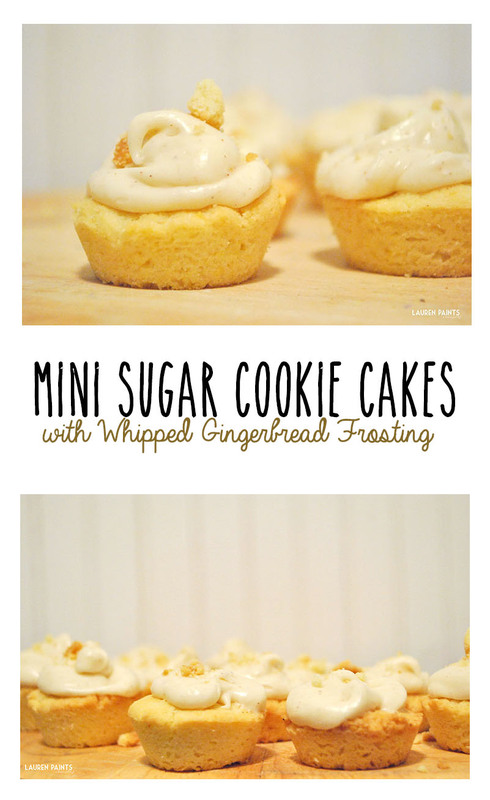 These little cookie cakes with gingerbread frosting are that easy! Just a few simple steps and now you have a delicious treat! So tell me, what kind of holiday traditions do you have in your home? I'd love to hear more about how you celebrate the holidays!